Many people with diabetes face difficulties and confusion when it comes to managing their diet. It would help a lot if they better understood how daily food intake affects the disease. Glucose is converted from food. 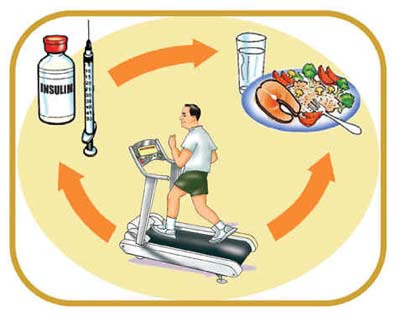 When glucose gets into the blood-stream, it stimulates the body to produce a hormone called insulin. This hormone opens the body's cells to receive the glucose that is needed as fuel. The blood glucose level reduces as more glucose is taken up by the cells. With diabetes, however, it's a different story. Generally, the body does not produce enough insulin or the cells themselves are not sensitive to insulin. As a result, glucose can't easily get into the body's cells. So, it stays in the blood, where it accumulates to dangerous levels. Meanwhile, the cells are starving for glucose, bringing on lethargy and fatigue. This is a reason why people who don't control their diabetes often complain of feeling unwell. High blood glucose levels also damage the large and small blood vessels. Prolonged poor control often leads to life-threatening diseases, such as heart attack, stroke, high blood pressure, kidney failure, blindness, nerve damage and poor wound healing that's responsible for foot ulcers and amputations. Clearly, people with diabetes need to manage their diet. Here are some easy and effective tips. Stay balanced. You need a balanced intake of energy and nutrients (such as carbohydrates, protein, fats, vitamins and minerals) like any other person. Since different foods provide different nutrients in different amounts, eat a variety of foods. Avoid overeating. Eating beyond your needs leads to unhealthy body weight increase. This exacerbates diabetes in more ways than one. Besides, there is also the associated tendency to consume more fats than necessary, a factor that contributes to cardiovascular risk. Go for complex carbs. Carbohydrates are the body's primary source of glucose. Everyone (including people with diabetes) needs adequate amounts of carbohydrates, preferably the complex type. Sources of complex carbohydrates include unpolished rice, wholemeal bread, biscuits and breakfast cereals and tubers. You'll also find complex carbohydrates in vegetables and fruits. Compared with refined carbohydrate foods, the complex varieties tend to take longer to digest and won't cause a quick rise in blood glucose. Don't add sugar. Even people without diabetes are advised to cut down on their sugar intake, as it contains no other nutrients besides calories. Among people with diabetes, sugar needs to be treated with even greater caution. Sugar can cause a sudden surge in blood glucose. It's best not to add sugar to your foods and drinks, or at least reduce the amount. If you are one of those who can't do without the taste of sweetness, you can substitute the sugar with a low-calorie sweetener; you'll get to enjoy the sweetness, with much less calories. Watch for hidden sugar. People with diabetes are advised to watch out for foods (e.g. cakes and certain desserts) that use sugar as an ingredient to provide texture or body. While such treats are acceptable on occasion, some of them (e.g. konyaku jelly and corn cakes) can be made better by substituting the sugar with a low-calorie sweetener. Eat smaller, more frequent meals. Your body can only handle so much glucose at a time. So, spread out your food intake through the day so that it is consistent and won't force your system to adjust to different blood glucose levels. Light, healthy snacks are acceptable, especially when you're hungry. Track and adjust. Using a glucose meter, you will be able to check on your blood glucose level. You will be able to respond to the reading by adjusting your food intake (along with physical activity and medication or insulin). If your reading happens to be high, you might pass on certain foods. If it is low, you may decide to eat before you go out, or pack along some foods to eat on the road. While diabetes demands good dietary management, it doesn't mean that you cannot enjoy eating. It doesn't call for a rigid and tasteless diet (which will only discourage your efforts in the long run). Work with your doctor and dietitian to develop a sensible diet plan. That way, you won't miss out on the good things in life.